The accusation is that $1000 worth of unsold articles were kept by BlogMutt when the account was closed for no reason. Of course, there’s no way to know if that's true, but it doesn’t inspire confidence either. 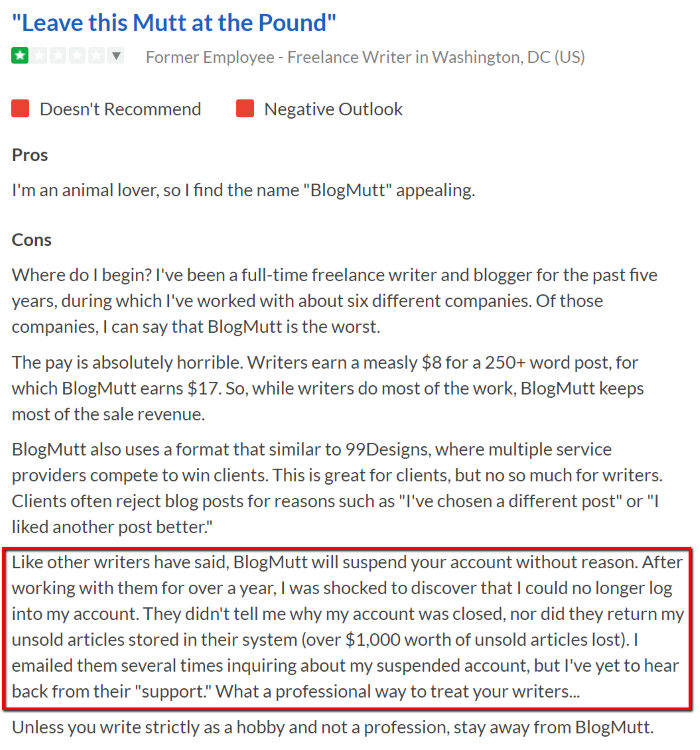 It’s easy to see why someone might read a complaint like that and consider BlogMutt a scam. What they’re saying here is that they don’t have to pay you for your submitted content if it gets sold after your account is terminated. The obvious question is why your account was terminated… but they don’t need to give you a reason. So, any way you slice it… you’re taking a risk. It would be nice if these policies where made obvious rather than burying them in a wall of legal text, but the point remains… BlogMutt has every right to protect themselves and set their own rules. Whether you choose to play by those rules is up to you. All things considered though, BlogMutt employs thousands of writers who I’m sure are happy and in no way consider them to be a scam. As mentioned earlier, BlogMutt only hires US writers and their acceptance rate is roughly 5%. Currently there is a waiting list when you apply. It should also be mentioned that this is a ghostwriting opportunity. You’ll be paid for your work, but you won’t be credited for it. 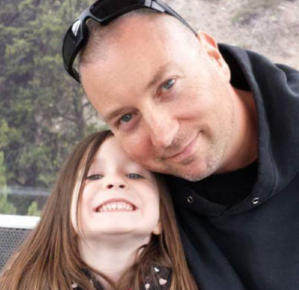 One reason writers like BlogMutt is that you can choose your own topics and clients. Rather than specific assignments with targets and deadlines, you can search through a list of projects you’d like to work on and submit them for review. While it’s nice to choose when and what to work on, the problem is that your article gets placed in a queue and the client might not buy it. If they do buy it, be prepared to make revisions. If they don't buy it, you can modify your article and recycle it for another submission later on. Like all content mills though, there’s always a possibility you won’t get paid for everything you write. A simple way to avoid this (or at least limit it) is to pay close attention to your client’s instructions. Tone (Friendly, conversational, professional, etc.). Style and Format (for example… short paragraphs and frequent headings). Keywords that get used by search engines. Also, try not to take rejections personally. Writing is subjective and sometimes the client will give you bad instructions, because they don't even know what they want. Or, your style might be perfect for one client, but wrong for another. Starting pay is $10.50 for a 300 – 400 word post, which isn’t terrible. As you progress and prove yourself, you’ll be given higher paying projects. Some writers report earning as much as $25 - $30 hour. Of course you'll have to average that rate with the articles you don't get paid for. You’ll have to invoice BlogMutt for each piece of content you sell and payments are made weekly on Mondays via PayPal. We’ve already discussed the cancelled accounts with no explanation, which seems to be the most common complaint. BlogMutt does not allow communication between clients and writers, so establishing a long-term working relationship is difficult. Complaints about customer support (although some reviewers say their support is extremely good). You’re only a ghostwriter so you’re not ever given credit for your work and therefore can’t use it for your portfolio. It should be mentioned that many of these complaints are subjective. As mentioned, some people report having a good experience with customer service. Other people like not having to communicate with the client… they just want to write articles. Choosing their own topics to write about. The potential to earn higher pay than what most content mills offer. Plenty of work available and no deadlines. Good writers can potentially earn a full-time income. Work when and wherever you want. Starting pay is not great. Account terminations with no explanation. No passive income potential. When you write for someone else you only get paid once. The internet is probably the best thing to ever happen for writers, but that doesn’t mean it’s a cakewalk out there. There’s a mountain of competition, and attention spans are getting shorter by the day. I wouldn’t put all my eggs in BlogMutt’s basket... there are hundreds of work at home opportunities to diversify your freelance career. But... they are definitely worth considering. It may be tough to get hired, but a good writer can eventually earn a decent income there. If you can do it, I always recommend writing for yourself. Not only do you maintain the rights to your work… but whether it’s a blog, book, script, or something else… you’re working towards a passive income that’ll last for years. I hope my BlogMutt review was helpful and if you have any comments, questions, or experience with BlogMutt… please share in the comments section below.